WSU Fulbright scholar Fitria working in laboratory. 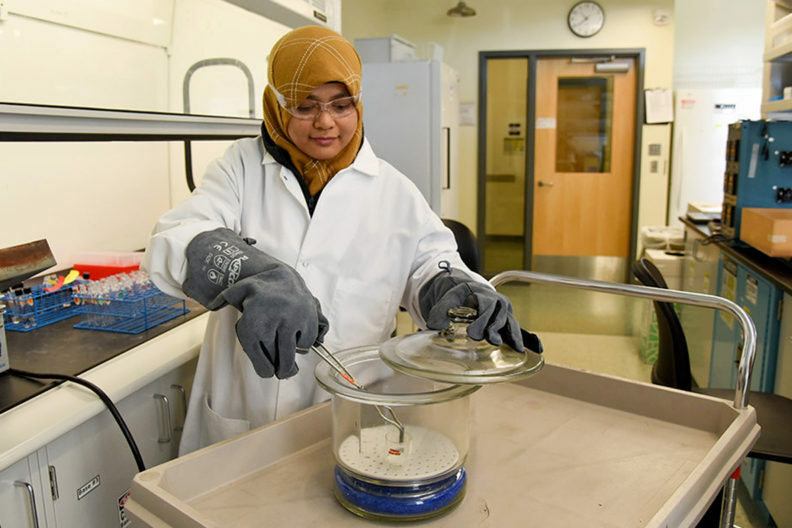 Fulbright scholar Fitria is using her educational experience at Washington State University Tri-Cities and the Pacific Northwest National Laboratory to find new and improved ways of creating successful biofuels and bioproducts. In her home country of Indonesia, Fitria, who goes by one name, is a team member and former project leader in biomass process technology and bioremediation at the Indonesian Institute of Sciences Research Center for Biomaterials. Her work for the center involves converting lignocellulosic biomass—the cellulose and lignin-rich substances that give plants their rigidity—from agricultural residues to ethanol and other bioproducts such as wood adhesives, biocomposites, pulp, and paper. In recent years, the Indonesian government has focused more heavily on the production of biofuels. And while ethanol, which in Indonesia is mostly made from cassava, a starchy root from a tropical crop, is readily available, Indonesian scientists are exploring other options, especially lignocellulosic-based biomass made from local vegetation. Cellulose from the remains of pressed, harvested oil palm fruit bunches could be a viable option, as Indonesia is the largest producer of the fruit in the world. Other potential products include rice straw and sugar cane bagasse. In order to fulfill her career goals, Fitria joined a team led by Bin Yang, associate professor of biological systems engineering at WSU Tri-Cities, in August 2016. Over the past three years, she has worked in the Bioproducts, Sciences and Engineering Laboratory at WSU Tri-Cities to improve understanding of the fundamental mechanisms of pretreatment technologies for cellulosic-based fuels. Her work helps advance cutting–edge biomass conversion technologies which could facilitate the commercialization process. At WSU Tri-Cities, Fitria is studying several types of lignocellulose biomass, such as corn stover and wheat straw, which are among the most common agricultural waste products in the U.S.
Fitria is working with Yang to examine new ways of improving the pretreatment process in turning remnant lignocellulosic materials into biofuels. Cellulose, which is the main component of cell walls in plants, must undergo a pretreatment process to separate it from other major components, such as hemicellulose and lignin, to help enzymes convert it to sugar. After that, the sugar can be fermented into ethanol. Fitria is investigating how minerals and other components in plants might hinder this process. She is also working with Jian Liu, a senior chemical engineer at the Pacific Northwest National Laboratory, to study the impact that mineral components have on the pretreatment process. Starting this fall, Fitria will conduct her research as part of the WSU-PNNL Distinguished Graduate Research program. The WSU-PNNL program will not only aid in her doctoral study, but also provides her with the opportunity to gain hands-on experience in a U.S. Department of Energy national laboratory. Fitria’s research at WSU Tri-Cities is in line with WSU’s identified Grand Challenges of providing sustainable resources and in sustaining health. It is also in line with WSU’s Drive to 25.